Surely I've made the Food for Life Red Curry Chickpea and Sweet Potato Soup for my family? I make it for my Food for Life students and will be making it in class tomorrow using my Saladmaster MP5 electronic oil-core pot, and wanted to give that pot a try at home with this dish. It's a simple but tasty dish that is made by mixing in a tablespoon or so of Thai red curry paste with 2 cups of water, bringing to a boil, then adding a small sweet potato cut into small 1/4" or so cubes and a cup of cooked chickpeas. After about 5 minutes, the sweet potato should be just cooked; it is then taken off of the heat and a cup of baby spinach leaves are mixed in. After sitting for a minute or so, the spinach nicely cooks into the dish. I did essentially that tonight, but I had forgotten to prepare chickpeas. I like fava beans and tried cooking them this past July, but I found it difficult to remove the tough outer skins, so have tried purchasing canned fava beans, but they, too, have skins. I had a can in stock, and it came to my rescue tonight, so I could use the fava beans instead of the chickpeas. I also added maybe a cup of frozen mixed vegetables including shelled edamame. When I served, I mixed in a little salt. My family asked for some lime juice, so I added a teaspoon or so. I also made a new kind of rice by making Jade Pearl rice (using a 1 : 1 1/2 ratio of rice to water, a vegan bouillon cube, and a 20m simmer time), then mixing in a little chopped onion and chopped purple cauliflower. It was good! I was surprised that even my spice-averse daughter loved the main course. I guess the heat was sufficiently dilute that it didn't affect her. The MP5 pot worked like a champ, heating up quickly! Topping this with something like black beluga lentils would make a filling and even more nutritious meal. I haven't used black belugas much, and have gone with a 1:4 ratio of lentils to water cooked for 15-20m (12m for salads), but the livestrong.com site suggests a 1:2 ratio for 25m; I decided to try this out. Here is what I did. I warmed up a cast iron pan with no oil for a few minutes on medium heat, then added the tempeh and green onion. I turned the tempeh and mixed the onion occasionally, cooking till the tempeh was gently brown (maybe 6-8 minutes). In parallel to the tempeh, I got a cup of black beluga lentils simmering with two cups of water and a vegan bouillon cube. I sampled after 20m and there was still a bit of liquid, with the lentils not quite ready, so I cooked for 5m more. I served in each plate a slice of tempeh topped with salsa then another tempeh slice, put on a generous serving of lentils, and garnished with the scallion. I surrounded the main course with cucumber and radish slices. I topped the cucumbers with Key Lime - datil pepper blend and Hawaiian black salt, and just the black salt on the radish slices. We all enjoyed the meal. I'm so happy with the lentils - I am going to go with a stovetop 1:2 ratio for 25m from now on. I thought that the main course was a bit "heavy" but good and certainly filling. I like the basic idea that I came up with today. 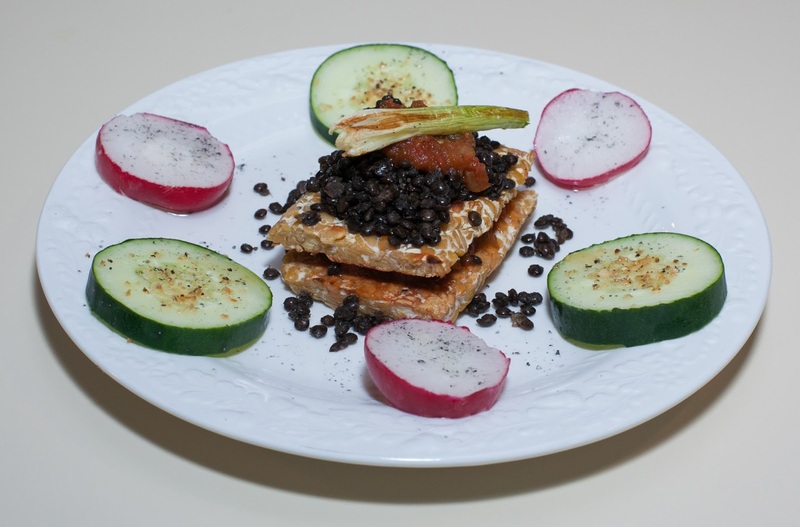 I'd like to try thinner (if possible) tempeh slices with a salad. Maybe I could have an "open faced" one slice of tempeh with crunch cabbage or lettuce, tomato slice, lentils, and hot sauce, or something like that. Mushroom would also be good. I like Saladmaster pans; they are made of a high quality stainless steel mixed with titanium which is non-reactive to food, and are one of my secrets of no added fat cooking as food sticking is not much of an issue. I have an electric 5-quart oil core roaster; it has oil sealed in it that quickly heats up and evenly warms the contents from bottom and sides. I tried it out for the first time a few days ago and used it in a Food for Life class yesterday at a venue that doesn't have a kitchen. It heats up quickly and seems to be even in its heat distribution. I love being able to cook without a stove. It seems so easy to make brown rice in the MP5 that I thought I'd give it a try - I just put in a cup of rinsed brown rice, two cups of water, and a vegan bouillon cube. I pressed a button twice to get into a "rice 2" program, then put the cover on. I didn't pay close attention to time, but it was only about a half hour by the time the MP5 finished. 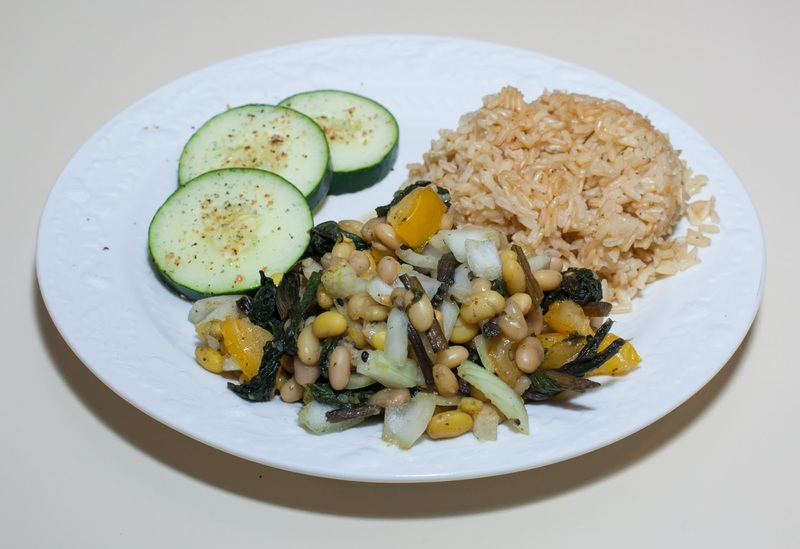 Here are details of the main dish of navy beans with beet greens and tomato, as well as more on the rice. I put the beans, rice, greens, ginger, garlic, curry powder, black sesame seed, and bouillon cube into my Instant Pot pressure cooker and cooked for 25m. After the cooking was done, I waited a few minutes and gently released pressure, then added salt, onion, tomato, and lime juice, and served. Dinner was good! My daughter initially complained when she heard that I was cooking navy beans; she loves black beans but said she didn't like navy beans. But even she enjoyed all of the dinner items. I thought that the beans were a little firmer than they could have been, and could have benefited from another few minutes of cooking. The rice was really good! Initially, it had absorbed the water and was certainly edible, but could benefit from a bit more cooking, so I let it go for another 4 or 5 minutes with another 1/4 cup or so of water. I want to make brown rice side-by-side in my Instant Pot, Saladmaster MP5, and Zojirushi rice cooker and see how it differs. Also, cooking beet root would have been interesting with the beans, adding color and another taste dimension. I thought that it might be good to make a cauliflower dish and came up with the idea of combining cauliflower with seitan. Here is what I did. Cauliflower is supposed to cook in 2-3 minutes under pressure. I put the cauliflower, garlic, bouillon cube, and water, and bouillon cube into my Instant Pot pressure cooker and cooked for 2m. In parallel, on a cast iron pan with no added oil, I sauteed the onion for 3-5 minutes till lightly caramelized then added the seitan and cooked another 4-6 minutes till the seitan was lightly browned. I had meant to do a quick release of the vegetable right after cooking but forgot; I did a quick release when I remembered and mixed in the peas, salt, turmeric, miso, and seitan plus onion. I served the cauliflower with long-grained brown rice.